In the world of politics, perhaps far more than deliverables, it is all about perception and how well a politician and his team can use perception building tools to their advantage. Mr. Rahul Gandhi, as any observer of politics would have realised by now, is not an astute politician. One is reminded of the sing song mocking meted out to Rahul at the hands of Gardiner Harris : “He’s terrible. He’s not a politician”. But since Congress is more of a family business, it is obvious that they would have tried to brush up Rahul Gandhi’s image, considering they can’t exactly get rid of him. From a moribund and witless entity, the Congress social media presence has changed to ‘energetic and charged up’, we have been told repeatedly. While those claims will soon find their answer in the upcoming polls, there’s one unmistakable subtext in all the hype and hoopla surrounding the Congress social media ‘surge’. The fingers are all pointing at Divya Spandana. Rahul Gandhi’s now-a-rally-now-a-vacation style of politics, lack of articulation and general distaste and inability for interaction are common knowledge for anyone who has been observing politics for over a decade. His recent ‘resurgence’ on social media, especially the quips and one-liners from his twitter account, hence, are scarcely believable as his own. To the regulars on Social Media, the Congress game was pretty obvious, almost instinctively. People are often trolled and abused mercilessly by handles that seem to have been made solely for that purpose. But a recent trend emerged that even got the Main Stream Media wondering. 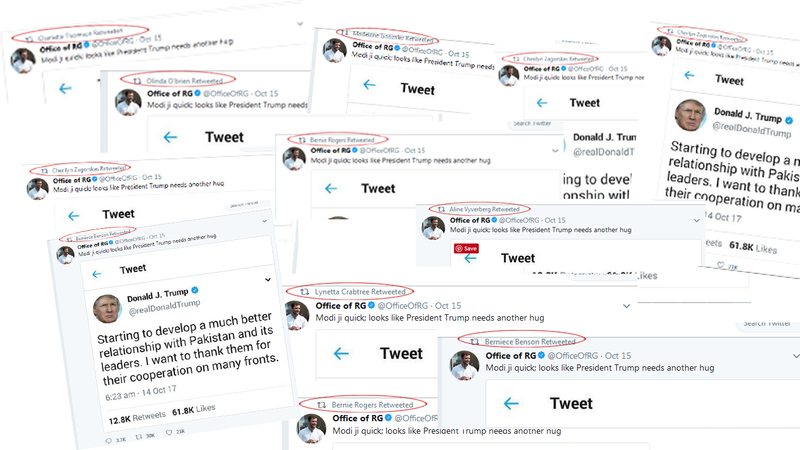 Today, ANI Digital published an article that pointed towards ‘bots’ that have been re-tweeting the rather politically casual tweets of Rahul Gandhi. 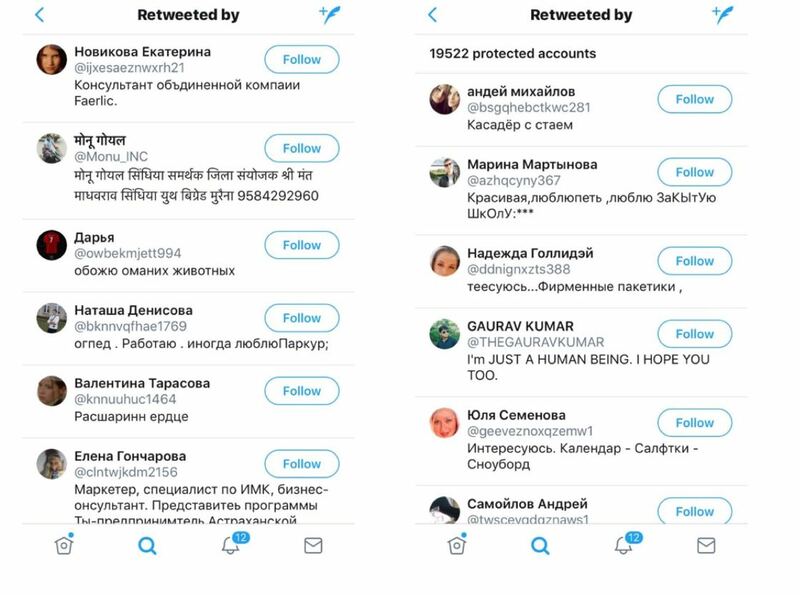 These bots also appear to be of Russian, Kazhak and Indonesian origin. What is striking, is the resemblance between the twitter controversy that erupted during the Donald Trump campaign and Rahul Gandhi’s Twitter “resurgence”. Not too long ago, news surfaced that Rahul Gandhi might be taking a leaf out of Trump’s book and was in talks with Cambridge Analytica, which had earlier helped Donald Trump win elections through a targeted communication campaign. 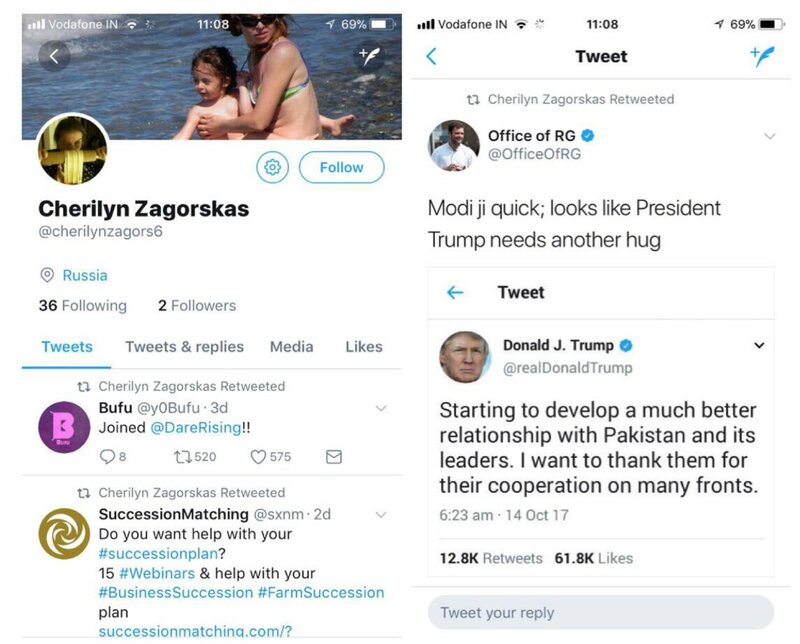 Trump had stirred up a storm in the USA when he had reportedly quoted and thanked a Russian Bot who was positioned as a “Trump Fan”. One wonders, given how prone Mr. Gandhi is to committing faux pass, if the Congress IT Cell runs the risk of having to deal with a similar situation sometime in the future. Not surprisingly, Cambridge Analytica was a questionable company that also frequently used Russian bots. Though usage of bots by political parties is not uncommon, it is the constant tom-toming of “Rahul Gandhi’s resurgence” by Media and the Congress party that has now put the spotlight squarely on Rahul. Promptly enough, exploiting the obvious dissonance between the Rahul we all know and the Rahul behind his twitter account, Divya has made this her moment in the sunshine. Through a media blitz, she has clearly laid claim to all credit for his ‘makeover’. It is almost like she is saying, “We all know he is incapable of something like this. I am behind all this”. Further, by taking up all credit now, she has set herself up to become the point of blame for any failure and if news of Rahul Gandhi account being retweeted by Russian Bots is true, as it seems to be, perhaps the fall for it should not only be Rahul’s but Divya Spandana’s equally. In sales and marketing, there is a common truism that a strong product means the positions of sales and marketing people becomes weak. The product, on its own merit, hogs all the credit. However, when a product is weak, it is heavily dependent on those who sell it, thus strengthening their positions. This famed “resurgence” of Rahul seems to be more of a shot in the foot than a shot in the arm with young ambitious enthusiasts from the Congress party shooting ostensibly big bullets from Rahul’s weary, disinterested shoulders. However, there seems to be no downside for Divya Spandana. If the Congress succeeds (and after today, it doesn’t seem like it is going to), she will grow as she has already publicly taken credit for the ‘makeover’ through friendly media houses and reporters. If the Congress keeps failing, they may think they need more of her skills. In the worst case, she can simply blame the product. Rahul’s demeanor on Twitter has been politically flippant with fake news and misrepresentations being propagated without due diligence. The handlers of his account probably feel the news is worthy of being shared considering it has been written by party loyalists. One such incident recently was him sharing false news of renewed aggression in Doklam which was actively proven to be a lie. Rahul Gandhi was also caught lying recently when he quoted fake news by PTI about CM Yogi Adityanath’s education budget. Further, in an interview with DNA she was asked, “What made you say yes to the social media offer. It was the weakest department in the organisation? Firstly, it’s a direct indictment of the earlier system is not the best way to endear oneself within the grand old party. For example, what might Deepender Singh Hooda, the earlier social media cell in-charge draw out of this? Clearly, that he was slow and incompetent and that Divya has come in and made ‘people look at the Congress differently’. Divya Spandana saw momentary success, but as the conundrum reveals itself, the quality of the product she is endorsing seems to be catching up with her. It is said that a politician can survive being loved. A politician can also survive being hated. But, a politician can never survive being mocked, consistently. Rahul Gandhi is mocked incessantly for reasons not misplaced. But with these recent revelations of the reason of his “resurgence” on Social Media being Russian bots, the ordeal seems to have just begun for the Dynasty’s Prince.